Not to be confused with Scryer. The Scryers are a faction of blood elves led by Voren'thal the Seer. The group broke away from Prince Kael'thas Sunstrider, heir to the throne of Quel'Thalas and ruler of the blood elven race, and offered to assist the naaru in rebuilding Shattrath City. They are at odds with the Aldor, and compete with them for power within Shattrath and for the naaru's favor. 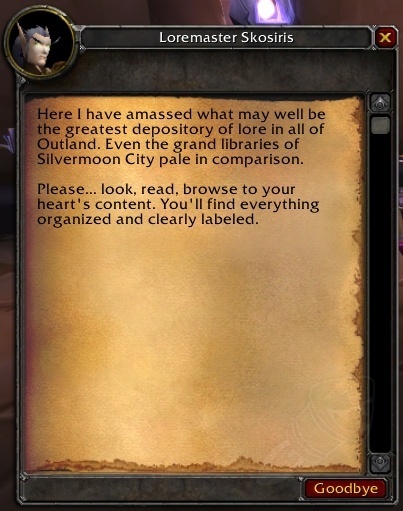 Nowadays, the Scryers are notable for having the largest library out there, housing the "greatest repository of lore in Outland". Characters may join the Scryers by completing the quest  Allegiance to the Scryers, thereby becoming friendly with the Scryers and hostile with the Aldor. As of the events of Warlords of Draenor, Scryers still answer to the naaru first and foremost. History from the Burning Crusade flash site. This time, the attack [on Shattrath City] came from the armies of Illidan Stormrage. A large regiment of blood elves had been sent by Illidan's ally, Prince Kael'thas Sunstrider, to lay waste to the city. As the regiment of blood elves crossed the bridge, the Aldor's exarchs and vindicators lined up to defend the Terrace of Light. Then the unexpected happened: the blood elves laid down their weapons in front of the city's defenders. Their leader, a blood elf elder known as Voren'thal, stormed into the Terrace of Light and demanded to speak to the naaru A'dal. As the naaru approached him, Voren’thal knelt and uttered the following words: "I've seen you in a vision, naaru. My race's only hope for survival lies with you. My followers and I are here to serve you." The defection of Voren'thal and his followers was the largest loss ever incurred by Kael'thas' forces. Nor were these just any blood elves. Many of the strongest and brightest amongst Kael'thas' scholars and magisters had been swayed by Voren'thal's influence. The naaru accepted the defectors, who became known as the Scryers. As the forces of the Alliance and Horde began pouring into Outland, Kael'thas and his followers originally accepted the new blood elven pilgrims. However, these new arrivals were given menial tasks and treated little better than slaves, until the Scryers discovered that Kael'thas had entered into an alliance with the Burning Legion through the revelations of Sunfury deserters. Despite this revelation some other elves still decided to join their prince, prompting a recruitment war between Kael's forces and the Scryers. The Scryers offer a variety of services to those who swear allegiance to their cause, including an inn, a bank and various vendors. Their most notable services, however, are their Master and Grand Master Enchanter trainers, the availability of whom allows aspiring enchanters to attain mastery over the Enchanting profession without entering Uldaman. Of course, enchanters need not ally themselves with the Scryers simply to train as masters: the Scryer Enchanting trainers teach nothing that is not available through other trainers located in Outland. For help choosing between the Aldor and Scryer factions, see the article "Comparison of Aldor and Scryer Rewards." Reputation gains with the Scryers correspond with a 10% greater loss of reputation with the Aldor, and often result in gains with the Sha'tar. Blood elves who have not yet pledged allegiance to either the Aldor and Scryers will automatically begin as friendly with the Scryers and hostile with the Aldor. However, blood elves may choose to side with the Aldor once the opportunity presents itself, and are not banned from doing so simply because of their race. Turning in ten [Firewing Signets] to Magistrix Fyalenn in Scryer's Tier will grant +250 reputation with the Scryers. There is also a repeatable quest,  Single Firewing Signet, which yields +25 reputation for each Signet ring turned in. These Signets drop from low-ranking Firewing members found at Firewing Point Northeast of Shattrath City. Once reaching honored status, however, the Firewing Signet quests becomes unavailable. If no other reputation quests are done, 240 signets are required to go from friendly to honored, or 360 signets from neutral to honored. It is possible to submit Firewing Signets to gain rep more than is needed to obtain Honored. For example, if you are 25 rep points away from Honored, you can submit 10 signets and be 225 points into Honored. Once Honored, however, you can no longer submit Firewing Signets for rep.
At level 68, characters may start turning in [Sunfury Signets]. These drop from high-ranking members of the Sunfury Clan (i.e., blood elf mobs level 66 and higher). Although it is possible to turn in Sunfury Signets upon reaching friendly status, it is recommended that one save these items until attaining honored status. For every ten Signets, characters will gain +250 reputation. Upon reaching honored it will take approximately 1,320 Sunfury Signets to reach exalted if reputation from no other source is earned. [Arcane Tomes] may be turned in at any time to Voren'thal the Seer inside the Seer's Library on the Scryer's Tier. This yields +350 reputation per turn-in, plus [Arcane Runes], a form of currency used to purchase shoulder enchants at the Scryer's bank. As with Sunfury Signets, it is possible to turn in the Arcane Tomes before reaching honored, but for the same reasons it is recommended that characters save them until after attaining that status. Upon reaching honored it will take approximately 95 Arcane Tomes to go from honored to exalted if reputation from no other source is earned. It is possible to defect from the Aldor to the Scryers, though doing so destroys all reputation progress previously made with the Aldor. Players seeking to switch factions must find Arcanist Adyria, a Scryer located in Lower City. She offers the repeatable quest  Voren'thal's Visions, which requires characters to turn in eight [Dampscale Basilisk Eyes]. This quest yields +250 reputation with the Scryers and -275 reputation with the Aldor per turn-in, and also provides +125 reputation with the Sha'tar if one is not yet honored with that faction. Voren'thal's Visions may be repeated until neutral status is attained, at which time it becomes unavailable. Assuming one is exalted with the Aldor and hated by the Scryers, it will take 168 turn-ins, or 1,344 individual Dampscale Basilisk Eyes, to reach neutral status with the Scryers. Upon hitting neutral status with the Scryers, one's reputation with the Aldor should have deteriorated almost halfway into hostile. Arcanist Xorith and Haldor the Compulsive are reputation vendors who sell specialized Flasks only usable in raid zones to characters who are exalted with the Cenarion Expedition, the Sha'tar and the respective Scryer or Aldor faction. The flasks are only purchasable with [Mark of the Illidari], obtained from creatures in The Eye of Tempest Keep, Serpentshrine Cavern, Mount Hyjal and the Black Temple. The epic pendants sold by Shattered Sun Offensive quartermaster Eldara Dawnrunner in Isle of Quel'danas have procs that only trigger when at exalted reputation with Aldor or Scryer. What procs exactly depends on the neckpiece and which faction you have chosen. If one has not yet chosen either the Aldor or the Scryers, complete  A'dal and then  City of Light. Completing these two quests will lead to two new quests, one to become friendly with the Scryers, the other for the Aldor. Choose carefully! Even though characters can switch between factions as described above, it will take time. Now, however, Haggard War Veterans give you  A'dal. There are many quests for the Scryers concerning disrupting Sunfury operations and shutting down the manaforges in Netherstorm. These quests can be obtained at Area 52 upon achieving friendly status. Also, on the Scryer Tier in Shattrath City characters can talk to Arcanist Savan who will provide the feeder quest  Report to Spymaster Thalodien to talk to Spymaster Thalodien in Area 52. There are also several Scryer quest chains (and a Scryer only Flight Path) at the Sanctum of the Stars in Shadowmoon Valley. These quests require a neutral reputation. This page was last edited on 3 October 2018, at 13:24.